I have been a little slack on my Nailtiques Formula 2 updates so big apologies guys, but have been very good and kept up with the treatment still. I have noticed already that the peeling has stopped now my on left hand but on my right hand I still have some peeling which is nearly outgrown. I have noticed how my nails feel harder and don't feel thin or break as easily as they once did. I took this photo 2 days ago so you can see the peeling as outgrown now which is a BIG thumbs up! My poor hands take some bashing on a daily basis so I have to take extra care with my fingernails and find my cuticles get very dry quickly. Nailtiques have this fab Cuticle Care Oil which smells AMAZING!!!!!!! I love the roller ball end which is so easy and perfect for on the go. I try to use this morning and evening to keep my cuticles well nourished. This may seem a little pricey for a cuticle treatment but I've been useing this daily for a couple weeks now and have over 90% left still! I must admit I've been yearning for some colour on my nails so I've been using the Nailtiques coloured polishes which also have the superb proteins and nutrients which my nails need. So luckily you can have the best of both worlds! CAIRO is a stunning creamy finish polish which is described as a Pink Chocolate hue, all I know is this shade is beautiful! The Nail Lacquer with Protein is a nice 10ml size so well worth the money considering this is also treating your nails! I fancied some red colour blocking so I used 2 red shades on alternate nails and then using my Orly Dotter tool and Orly White Instant Artist I dotted white tiny dots in a semi circle above my cuticles. Such an easy simple look yet so eye catching thanks to the vibrant reds! MOSCOW is a classic red shade, similar to pillar box red in my opinion. I often think when deciding on a nail colour, if in doubt pick red! Red always catches your eye and stands out. 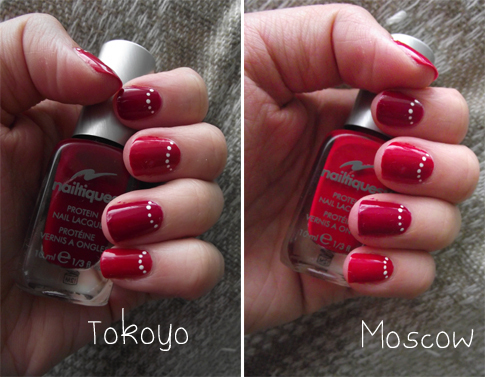 TOKYO is a deep red, when I applied this shade I thought of a blood red. I am reading the True Blood series at the moment and this reminded me of Vampires and blood. Sorry about that ha ha! So if you're a Vampire fan then you need this vampy red polish! You can pick these polishes up from Look Fantastic I would say that the stock photos aren't as bright as the polishes are in real life so just bear that in mind. Look fantastic also now stock the Orly Instant Artist polishes which is great news!! Thanks for reading lovelies and hope you have a great day!